A pedestrian walks past the Manulife building in downtown Vancouver on May 3, 2012. Manulife Financial Corp. says a Saskatchewan court has ruled in its favour in the insurer's legal fight with hedge fund Mosten Investment LP over insurance contracts. A Saskatchewan court has dismissed lawsuits against several Canadian life insurers that claimed certain insurance products could be used as investment accounts that provided guaranteed returns to their policy-holders. Manulife Financial Corp., Industrial Alliance Insurance and Financial Services Inc. and Bank of Montreal all faced lawsuits in Saskatchewan last year over the fine print of universal life-insurance contracts. Hedge funds including Mosten Investment LP, Ituna Investment LP and Atwater Investment LP sued the insurers, arguing they were allowed to invest unlimited amounts of money in accounts associated with those contracts and earn guaranteed returns over the lifetime of the policies. The Court of Queen’s Bench for Saskatchewan dismissed the claims against the insurers on Friday, noting in the ruling that “in the some 30 years since universal life insurance policies have been sold, there is no judicial record of these policies being used in the manner proposed” by the hedge funds. In addition to the plaintiffs, the ruling is a blow to well-known U.S. short-seller Muddy Waters LLC, which went public with a bet against Manulife in October, arguing that the lawsuits could put the insurer at “risk of significant financial damage.” Muddy Waters was not a party to the lawsuits. 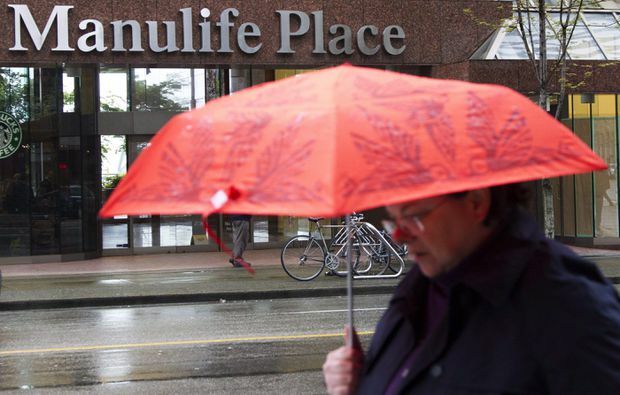 Manulife’s shares climbed 3.1 per cent on Monday and closed at $23.31. It is the first time they have closed above $23.19 since Muddy Waters released its report in October. Universal life contracts were popular in the 1990s and offered policy-holders a payout upon death, as well as investment returns throughout the life of the contract. The money managers pursuing the lawsuits argued the insurance products could be used as investment accounts that accept unlimited deposits – something that would allow them to earn attractive, almost guaranteed returns. Last week, the courts sided with insurers, saying the contracts were designed solely for insurance purposes. “It is my opinion that no insured [person] should reasonably conclude that the interpretation proposed by Mosten is consistent with the general economic purpose of life insurance," Justice Brian Scherman wrote in the ruling. However, in the latest court ruling, the judge determined that the regulations, as written, were only “prospective." The lawsuit against Manulife was in relation to a 1997 universal life-insurance contract that was originally held by a doctor but purchased by Mosten in 2010. The hedge fund argued the terms of the contract allowed it to deposit an unlimited amount of money with Manulife and receive an annualized guaranteed return of at least 4 per cent. Manulife argued the policies were never intended to be used as deposit or securities contracts, calling the case “legally unfounded and commercially absurd." “We were always confident we would ultimately prevail in this matter and that it would not have any material impact on the company’s business,” Manulife said in a statement. In his decision, Justice Scherman said the policy in question “does not provide for unlimited stand-alone investment opportunities within the carrier fund." Both IA and BMO said they were “pleased” with the court’s ruling. In Canada, Muddy Waters is well-known for its successful bet against Sino-Forest Corp. in 2011. Last fall, Carson Block, the founder of Muddy Waters, revealed a short position in Manulife with hopes of a drop in share price if the insurers lost the lawsuit. Mr. Block declined to comment. The hedge funds have the right to appeal the decision. Gary Selke, an adviser to Mosten, Ituna and Atwater, says they remain highly confident in their legal analysis and positions. “The applicants are reviewing the decisions and will determine their next steps to assert their contractual rights,” Mr. Selke wrote in an e-mail.